La Grotte de Lascaux (10 Km - 10mn) is situated near Montignac. 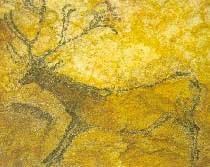 It was discovered in 1940 and has more than 1500 paintings and engravings dating back to prehistoric time. A replica of this cave is open to the public, where there are two reproduceds galleries. The “salle des taureaux” and “diverticule axial”. La Château de Losse (10 Km - 10mn) is situated in the Vezère valley. Once a medieval fortress hidden behind a high wall and surrounded by a deep moat, but now a beautiful château since 1575. 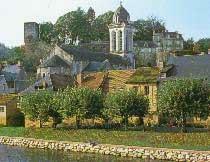 A walk in the beautiful perfumed gardens will lead to a magnificent view of the River Vézère. Montignac (10 Km - 10mn) is famous for the Lascaux caves, but it is also a very beautiful town with houses dating back to the middle ages and buildings from the 14th, 15th and 16th centuries. While walking beside the River Vézère, you can admire the ruins of the royal château looking down upon the town. L'Abbaye de St Amand de Coly (10 Km - 10 mn), is both a religious building and a fortress. We also recommend the wonderful walk in the countryside starting from the Abbey. Les Eyzies (18 Km - 15 mn) “the prehistoric capital” situated on the edge of the Vézère. 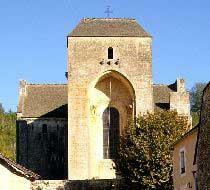 Here you will find prehistoric sites of the Périgord and a little church dating back to the 12th century. 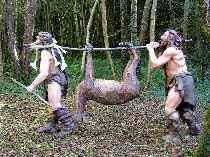 You can also visit the National Prehistoric Museum. 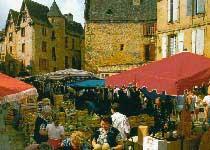 Sarlat (21 Km - 20 mn) is the tourist capital of the Périgord. Walking through the narrows streets, you will see many fine examples of gothic architecture. The magnificent cathedral from the 16th and the 17th centuries was originally built on the remains of a roman church. L'Aquarium du Périgord (30 Km - 30 mn) situated next to the village of Bournat, has an exceptional collection of fresh water fish including carp, trout, salmon and sturgeon. 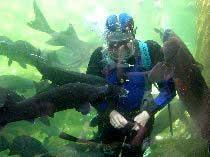 Children and adults alike can experience the feeding of the fish. 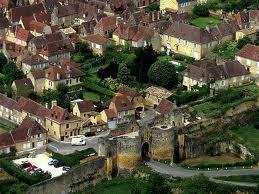 Beynac (32 Km - 30 mn) is a charming village built near a river and below a cliff with its 13th-14th century castle. 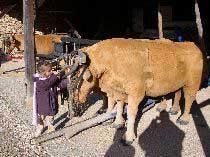 You will enjoy walking in the village with its 15th, 16th and 17th century houses. This is no surprise that Paul Eluard, the famous french poet, decided to spend his last days there . Domme (33 Km - 30 mn) is a splendid Bastide town from the 13th century, situated high above the Dordogne Valley offering superb views of this beautiful region. 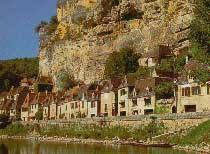 La Roque Gageac (33 Km - 30 mn) is a lovely village set between the Dordogne river and an abrupt cliff. It was classified as the third national site of France (after the "Mont St Michel" et "Rocamadour"). You can also visit, carved in the cliff, its troglodyte fortress. A nice little church from the 14th century offers a wonderful view over the Dordogne valley. Le gouffre de Proumeyssac (35 Km - 35 mn), 3 km to the south of Le Bugue village, is a 50m high abyss with numerous stalactites. 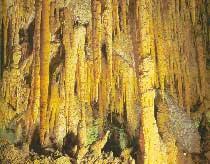 1km to the north-east is situated the Bara-Bahau caves with its prehistoric animals carved in the stone. 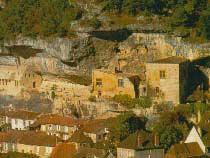 Castelnaud (35 Km - 35 mn) is a fortress set at the junction of the Dordogne and the Céou rivers. 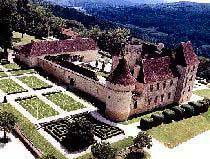 Its castle, beautifuly restored, offers one of the most beautiful views over the Dordogne valley. 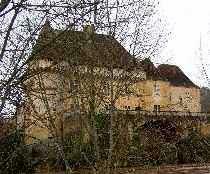 We also recommend you visit the middle ages museum, and the "Ecomusée de la Noix". 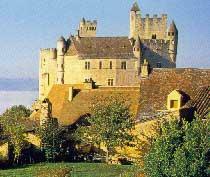 Le château des Milandes (36 Km - 35 mn) is situated on the Castelnaud district, and was built in the 15th century.There lived Joséphine Baker, which founded her "world village" to give a home to abandonned children. 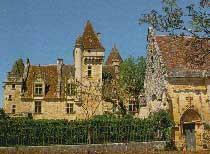 You can visit the castle, its park with the "french garden", a museum of Josephine Baker, and a museum of falconry.